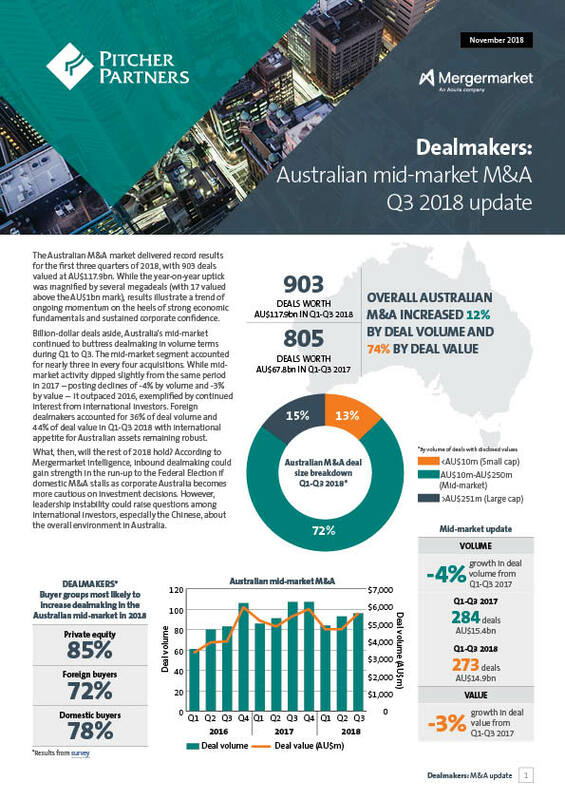 Mergermarket is pleased to present Dealmakers: Australian mid-market M&A Q3 2018 update, published in association with Pitcher Partners. Australian M&A for Q1-Q3 2018 increased 12% by deal volume and 74% by deal value compared to the same period in 2017, with deal values magnified by several megadeals (17 of which were each valued above the AU$1bn mark). The country’s mid-market helped buttress those figures, accounting for 72% of total deals and setting the stage for a promising finish to the year for Australian M&A dealmaking in 2018.